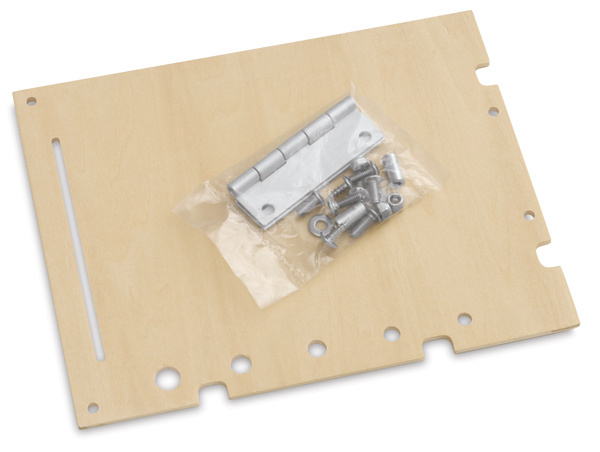 Hinged Palette Extension Kits can be mounted on either the right or left side (or both sides) of the pochade. Because of the special offset hinge, they will fold down into the box, allowing the lid to close. Aluminum offsets keep them from contacting the inside surface of the box, so paint does not have to be removed before packing up. Each extension features holes for brushes and a parking slot for the Guerrilla Painter Hang Up Brush Caddy. Simple assembly is required and all hardware is included. Choose Medium or Large to match the size of your French Resistance Pochade.